After following the North – South Caves to Caves trail, in the Kanangra-Boyd National Park, we have returned several times. 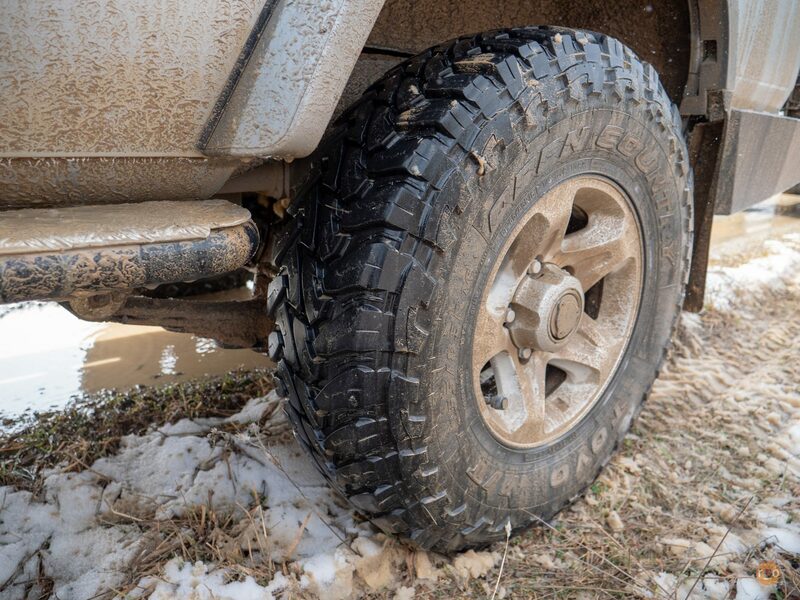 Day trips and overnight, as there are plenty of other tracks to explore. 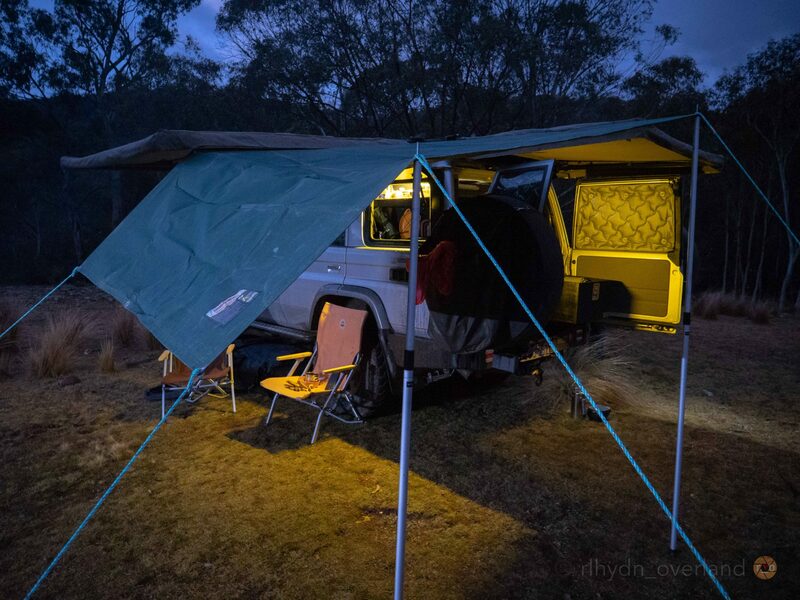 So, when a friend, an insatiable explorer such as ourselves, suggested a new campsite, and new trails; We packed the LandCruiser. Agreeing to meet at Burralow Creek camping area after work, we ambled firstly though Penrith, northbound, then back again as we had forgotten to pick up firewood, then again – northbound. Winding north by north west in search of this particularly urban patch of scrub. After some disagreement between Siri and Hema, we found the fire trail. Descending down and around, we both relaxed. Despite the sun having long set, the combination of ARB and Baja Designs lighting brightens any trail, and we’re happiest off of the bitumen. It wasn’t long before the campsite loomed on the Hema’s screen. Well, sort of. We would understand more in the morning, but the campsite has… shifted, since Hema’s cartography. Under the glow of LED lighting, I spotted our comrade already set up beside his Mitzubishi Challenger. Within minutes we too, were happily settled, awning out against the predicted rain. Charcoal smouldering for dinner in the Firepit. Chopping madly, I had a mountain of vegetables ready for the wok. Combined with chicken breast, herbs, spices, tomato paste, honey and soy sauce. I stirred through some precooked brown rice for good measure. 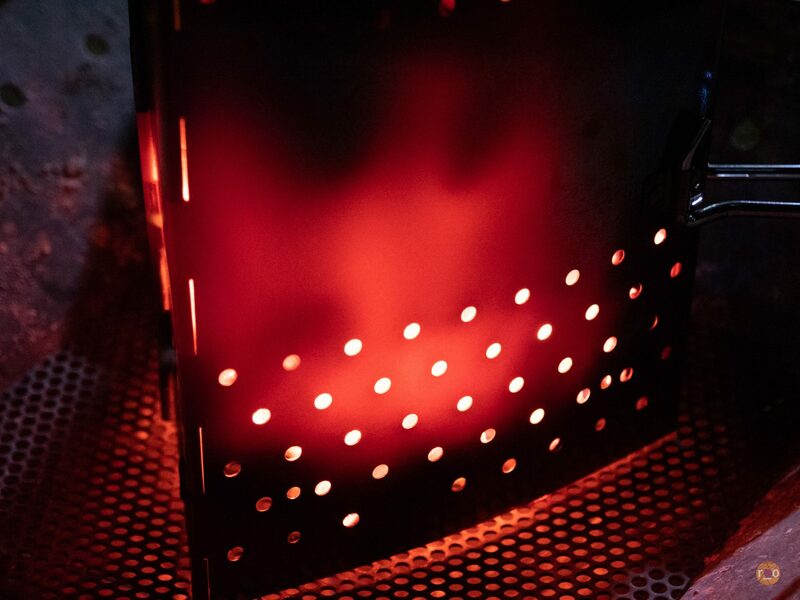 Afterwhich, we added wood to the coals. 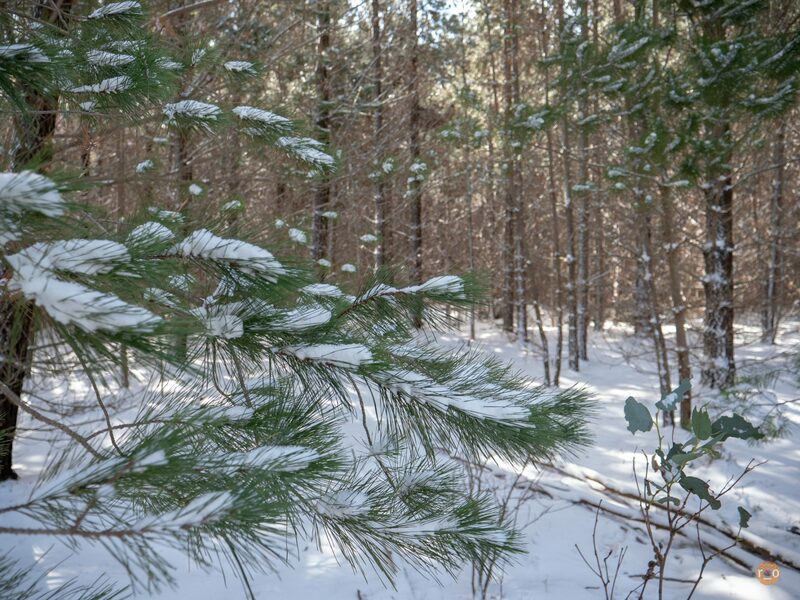 The chill had descended on the clearing. 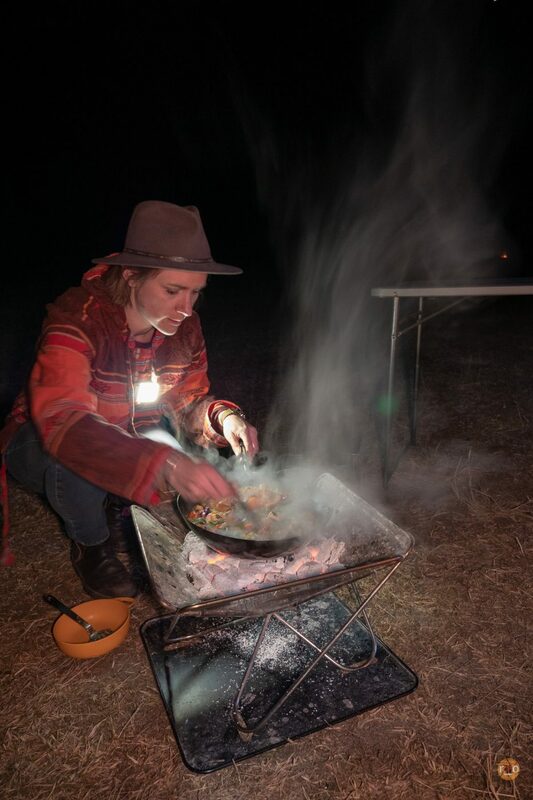 Through the steam of my dinner, I could see only two or three other camps around us. 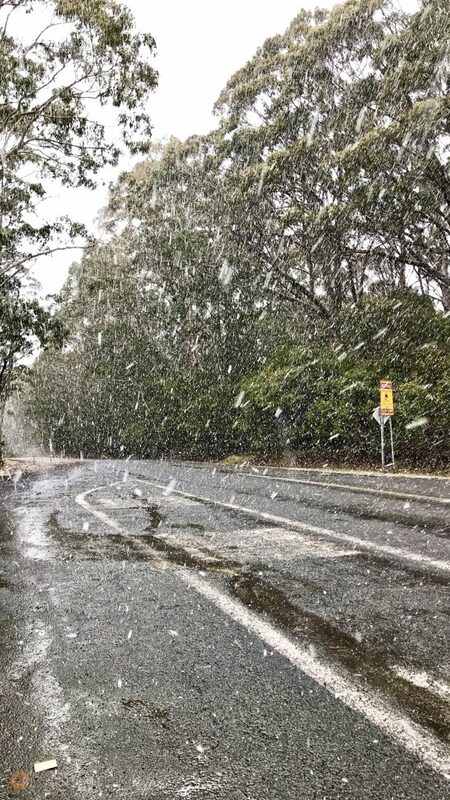 The weather prediction of rain surely had kept people away, this valley – so close to the suburbs seemed too good to be true. 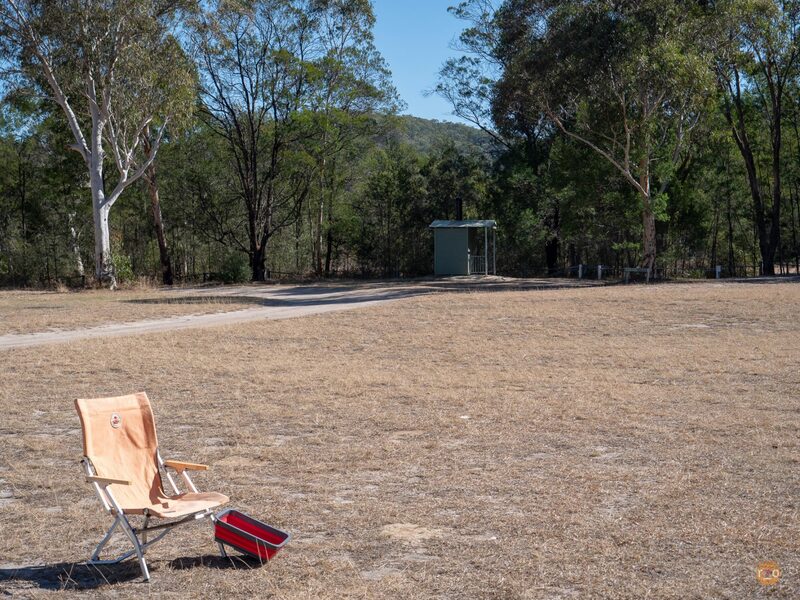 Flat open space, a creek (no more than a thickly vegetated dampness in this drought) surrounded us, and there were toilets. Catching up on each others lives, we also plotted tomorrow’s plan. 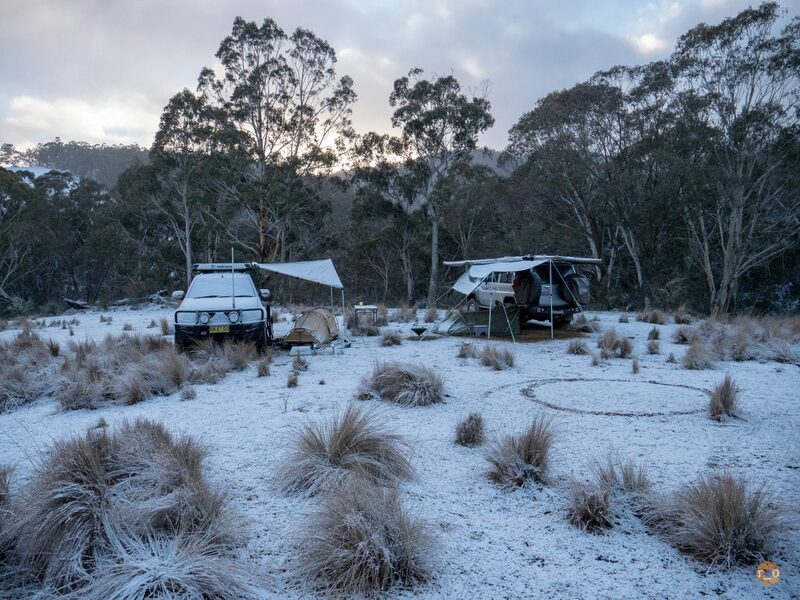 A leisurely cooked breakfast and then jet over the hills toward Oberon, stopping in at Bilpin for a pie for dessert that night. It was cold and a Friday night, so we were like zombies by the time we crawled into our swag. Utter blackness descended when I closed my eyes and I slept solidly until the sun lit up the clearing. 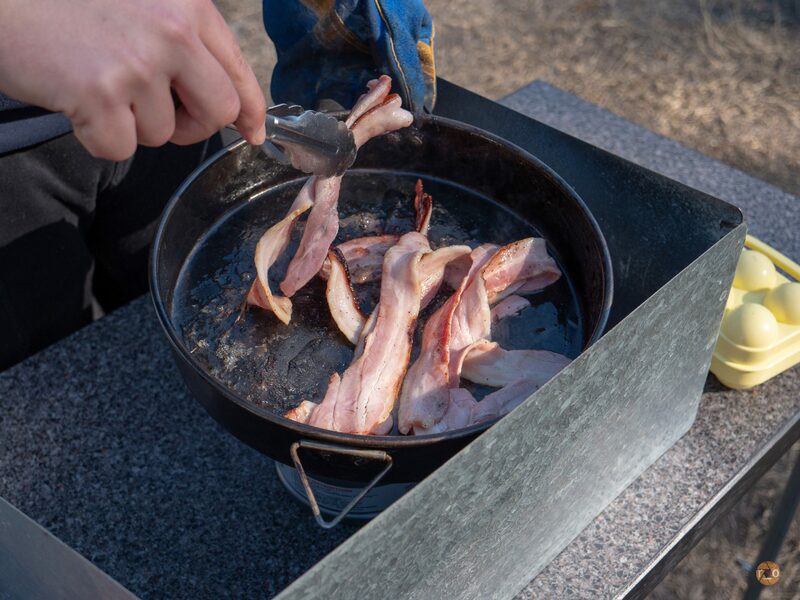 Fresh and a little frozen, we warmed up with bacon and egg sandwiches, cooked on the Coleman stove. 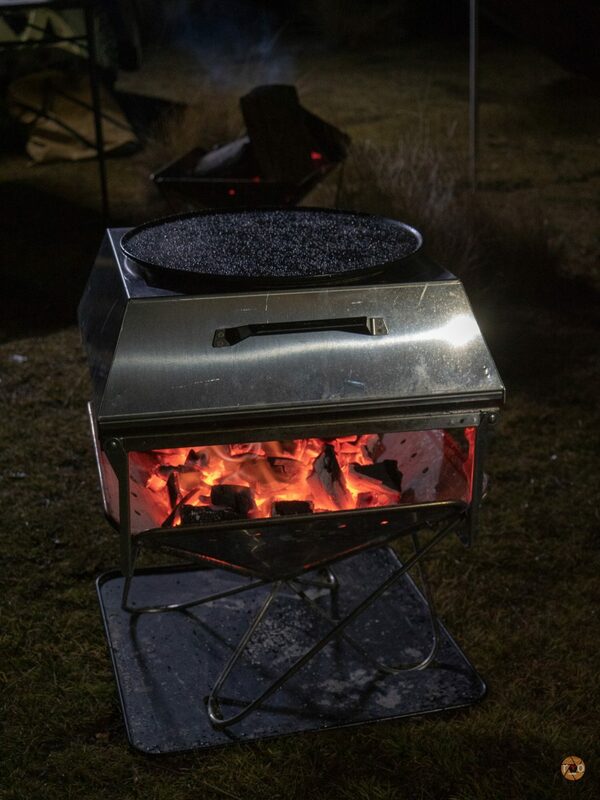 The lid of the Bedourie Oven rests perfectly atop and produces a tasty feast. Dragging our chairs into the sunshine we lazed about, waiting for the warmth and coffee to motivate any more movement. Wandering around the camp, I found gates and an older toilet site. I think, National Parks have moved the marked campsite between clearings, maintaining and regenerating the landscape from the damage of human traffic. So close to the urban sprawl, I was pleasantly surprised to find it rubbish and fire damage free. 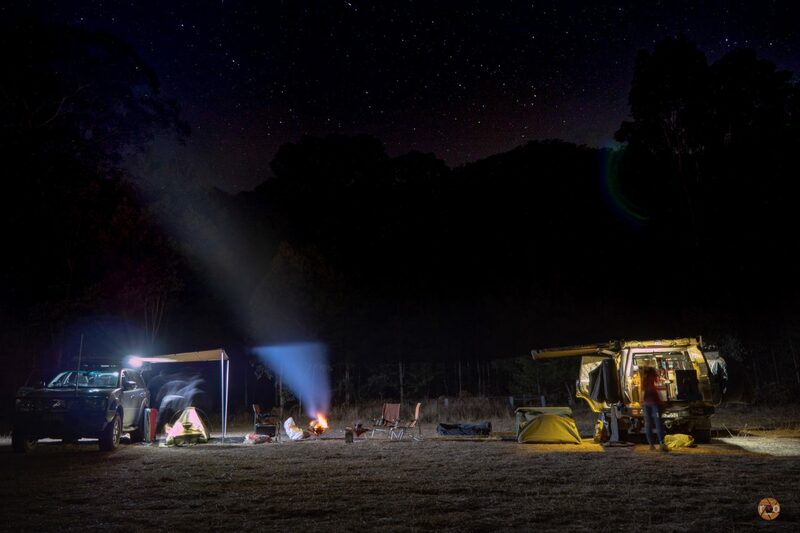 Swag rolled and pan cooled, we packed and headed out, following the fire trail as it continued, past our camp. The trail was rough to begin with, worn down to the rock, but nothing too technical. Slow enough to absorb the surrounding features. We stopped at a promising walk, looking for wildflowers. 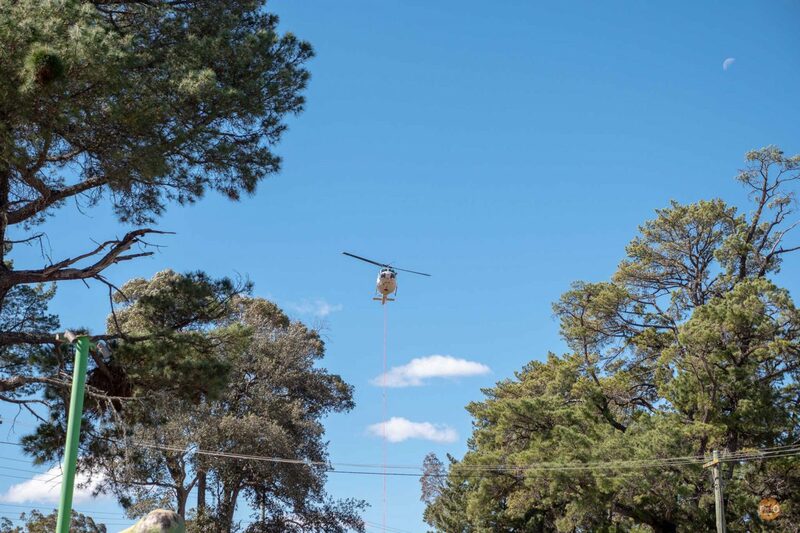 Arriving at the Fruitbowl, we watched the coordinated frenzy of fire fighting helicopters, refuelling to then collect water in their vinyl buckets for the bushfires north of us. Fuelling ourselves on brunchtime apple pies and coffees we plotted our route, on bitumen towards Oberon. We had read that Mount Irvine road was closed due to a bridge collapse so we postponed exploring there for another day. Putting air back in the tyres for the bitumen ahead, I stupidly left one of my TyreDog monitor caps sitting on the tyre, rather than screwed onto the valve. An expensive mistake that we wouldn’t realise until a later that day. Topping the range, we watched the weather intensify. 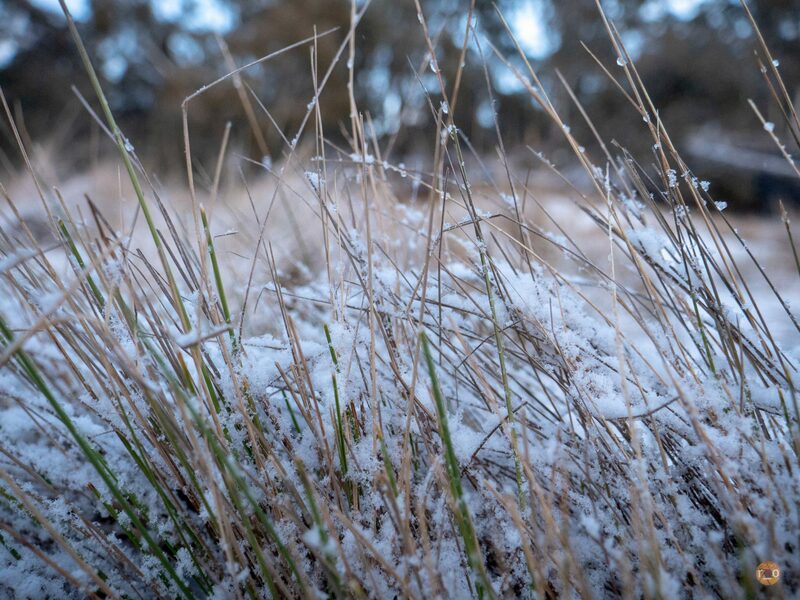 Gone was the sun of the morning, The grey gumtrees swirling in the squall. The clouds gathered, moved on and were replaced with others. 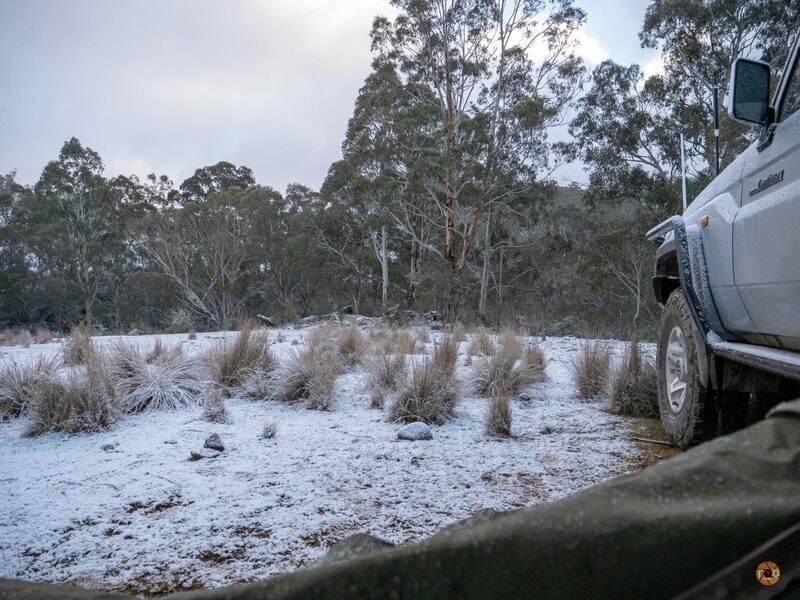 Before long, after cruising Jenolan Caves road, the snow began to fall. 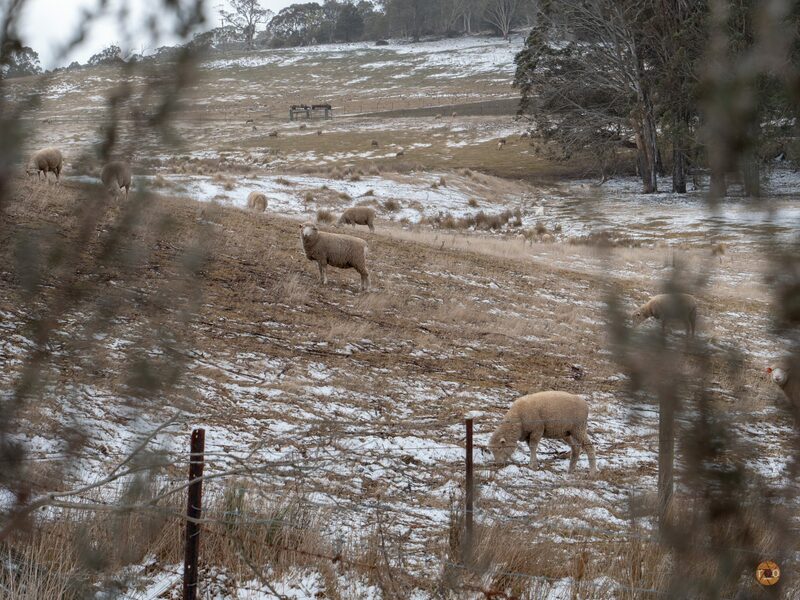 Immediately different to the ice and sleet we had experienced in the Victorian High Country, we were transfixed. Floating about, it felt ethereal passing through it. 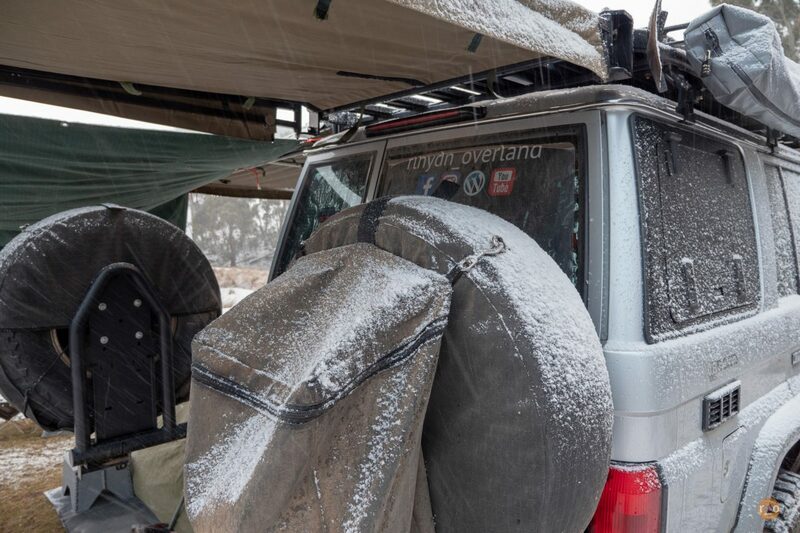 White powder gathered on the bonnet of the LandCruiser. A white wall building on the windscreen wipers, until I used them and the wall was rebuilt anew. Stopping at our turn, I danced about in the gentle snow whilst David let air out of the tyres. Discovering my loss from earlier, he dug out a spare valve cap from our kit. The quiet fall of snow is my new favourite thing. Without any wind, it gently tickles everything it touches. Before it miraculously builds up into a fluffy frosting over nooks and crannies first, and then any surface. The round slender branches of saplings, carrying all it can before it bows, purges and starts again. 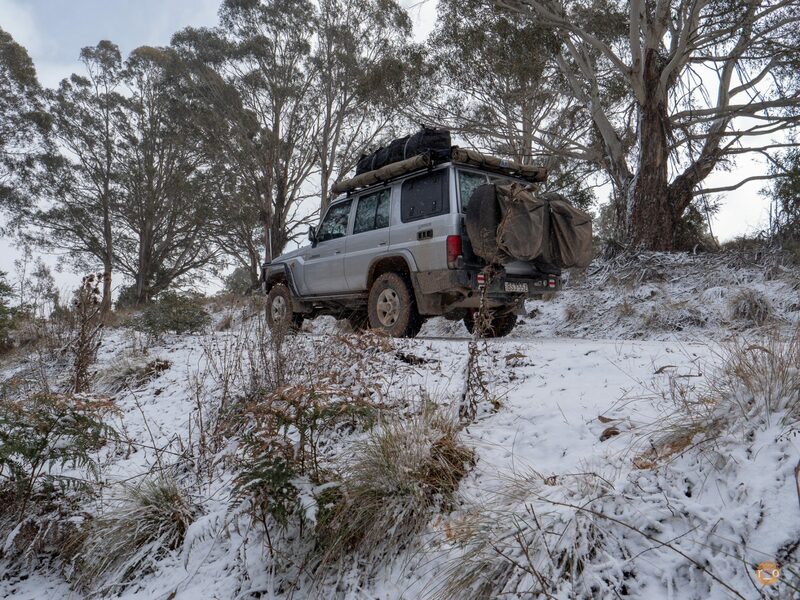 Heading off road onto the main track, the snowfall added to the serenity. 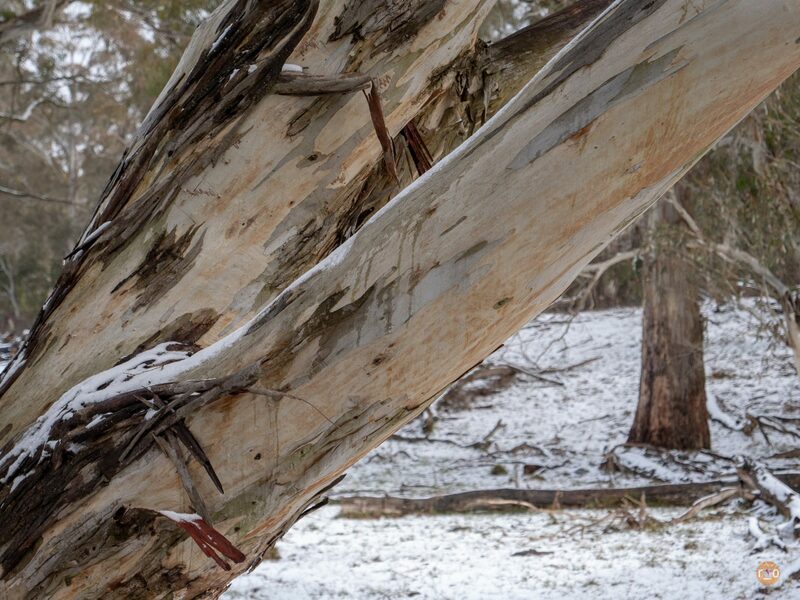 The milky brown dirt and sliver green gumtrees, all angles highlighted in white snow. But just like that, it was gone. As we descended, the area was damp, but the snow was no more. Heater blasting as it was only 4degrees, we continued. Wandering the tracks, we veered left and right, up and down. This is what I like about this area, lots of tracks veering off. Perfect for the aimless wanderer. Some are gated but there are plenty that are not. Enough to bring you back for another weekend. Nothing too challenging, except trying to capture a huge brown wombat with the camera before he cannonballed off into the bush. 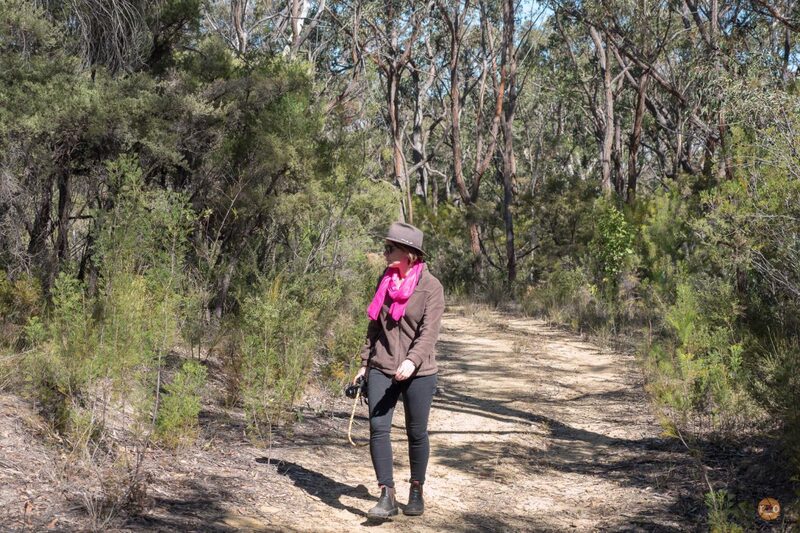 Eventually meandering into the Blue Mountains National Park, one such track demanded low range. The clay was a little slick and the track did not look overly used. Down we stepped, the occasional erosion mound slowing our descent. The valley seen through the trees was quite beautiful. Crossing a rocky stream we found a camp. There was rubbish, which we collected. The large pieces of random metal we stacked up, out of the fire pit. As I wandered about, the sun peaked from behind the clouds on a clearing ahead, making it glow. Before I could grab my camera, the sunlight winked out. My comrades followed me up the track and agreed. This would do, and do us well. As we untied the swag from the roof, the weather began to change again and we considered our exposed position. Reckonging ourselves safer in the clearing given the wild wind, we continued our setup. Taking in our camp, from under the hood of my Goretex jacket, we appeared to be in for a cold, wet evening. But the rain was noncommittal, returning in splutters and bursts with quiet lulls. We worked on an additional bit of shelter with our canvas tarp in one such lull. Just in case. I used my Snow Peak micro oval to heat up some pumpkin soup on the Coleman. We planned to make Pizzas for dinner but we had skipped lunch so this was an inbetween snack that noone argued with. 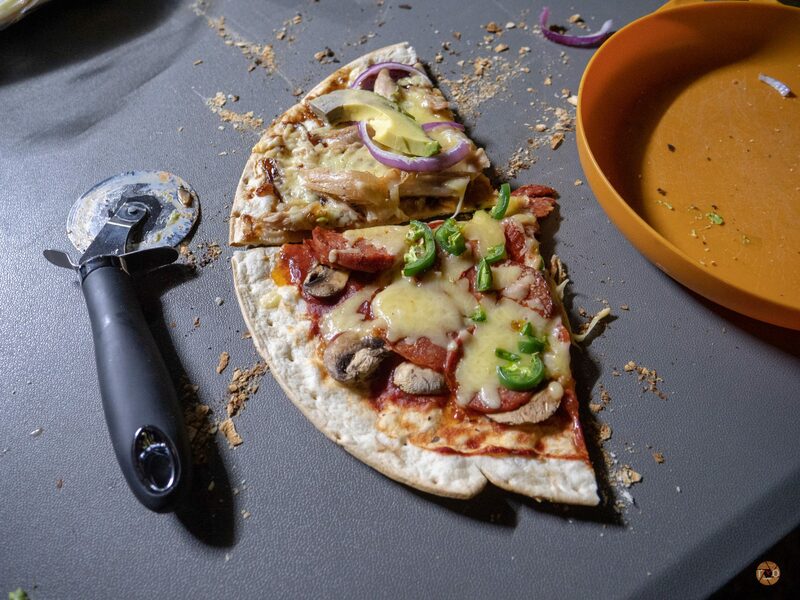 Using one Snow Peak firepit for warmth, the other for the Pizza oven, you can probably imagine how the night played out. Sporadic sprinkling, occasionally forcing us to shuffle our seats under our equivalent shelters before it passed and we could skoot back to the fire. Lots of tea, talking and bush telly. 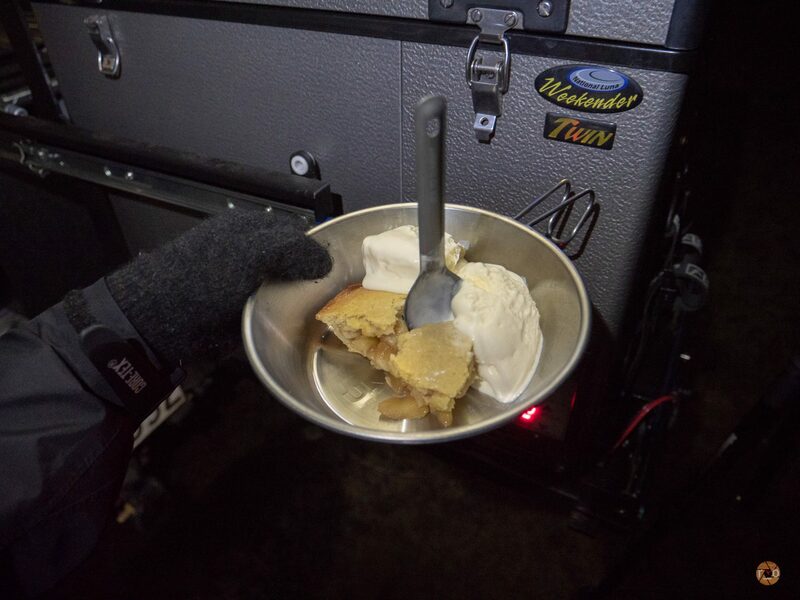 Three pizzas sizzled and indulgently consumed, we had to wait a while before fitting in some apple pie, warmed in the Snow Peak field oven with some icecream. The ambient temperature had turned off our fridge, so the icecream was thawed to an edible soft. The moon and wind surfing clouds argued against any star photography, but I played with the camera for a time lapse of the sky instead. We all retired to our swags, overfull but happy. We had run out of wood. The swag was toasty warm and the sound of the rain on the canvas – about as serene as it gets. The following morning, I woke feeling so refreshed. I had slept perfectly warm and uninterrupted. David was up, camera in hand urging me to do the same. The eerily tranquil quiet was back again. The rain was gone. It had just begun to snow. Gazing out the swag window I could see our valley was transformed. Torn between simply laying back and enjoying the best sunday sleep-in, or crawling out and experiencing our winter wonderland; I hesitated. David handed me my camera and after sitting up, looking about – I was convinced. As the sun rose, the gentle snow fell. 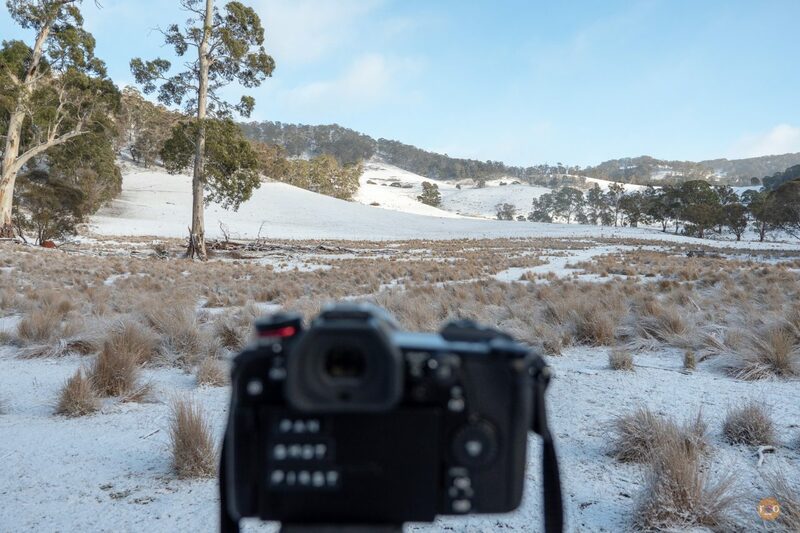 I set up a timelapse on the yonder hill which would surely melt with the rising sun. Evicting the snow from the firepits we eventually had one warm enough to cook bacon and eggs while we stomped around in the fluffy landscape. 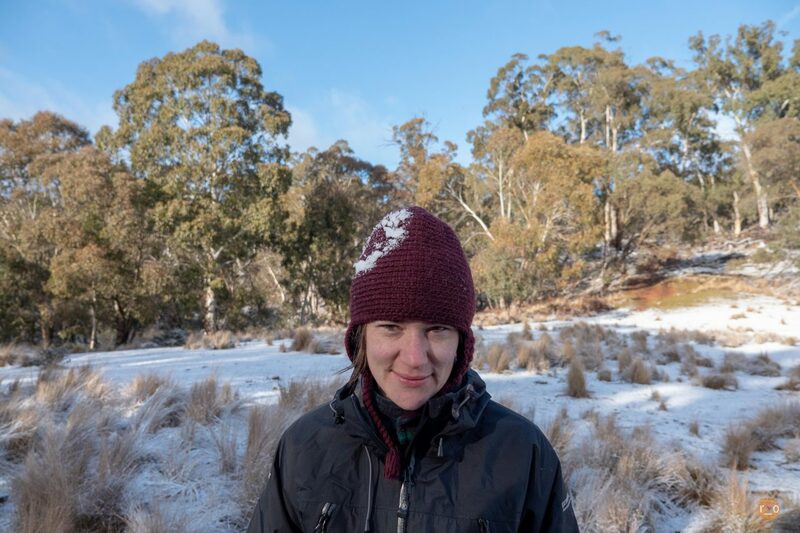 I was accosted with a snowball. 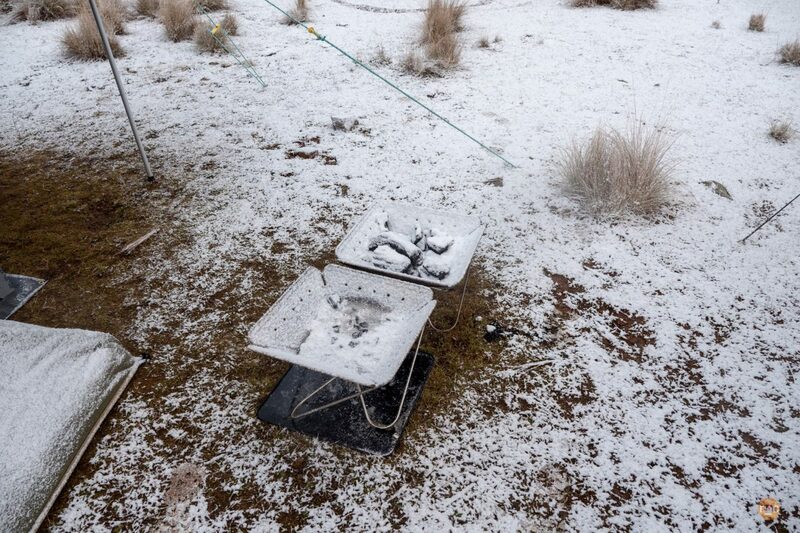 Doing our best to sweep the remaining snow off the canvas, about an inch thick, we reluctantly packed up camp. I was outvoted, no-one else wanted to wait around for the snow to melt to ice-water, soaking the canvas and the tracks alike. We had peaked at our exit and it was a clay based hill. Not as steep as our entry however. By the time we were rolling out, our valley had indeed thawed, but the hill was no obstacle. Climbing out of our valley, the snow returned and we haltingly wandered. Stopping to take photos and feel the snow tickle my face. 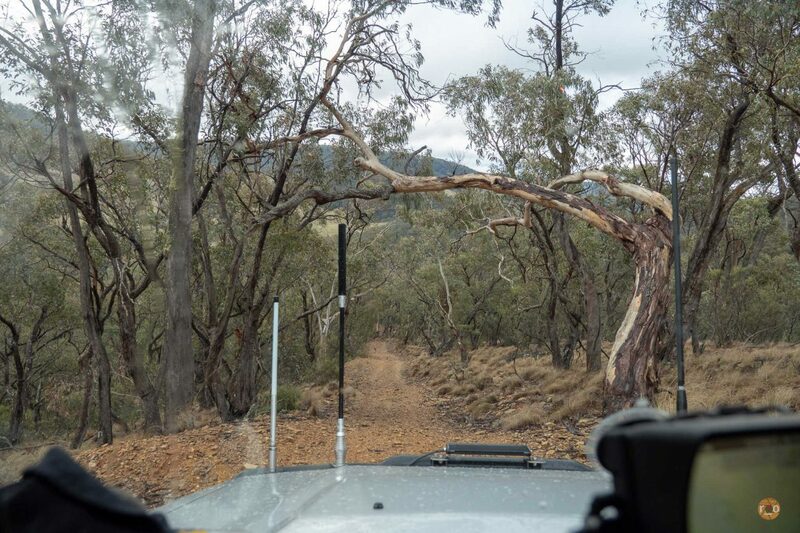 Zigging and zagging, we found a temporary appreciation for the neighbouring plantation in Gurnang State Forest. The snow looked good in there. I enjoyed the monotony of the landscape. 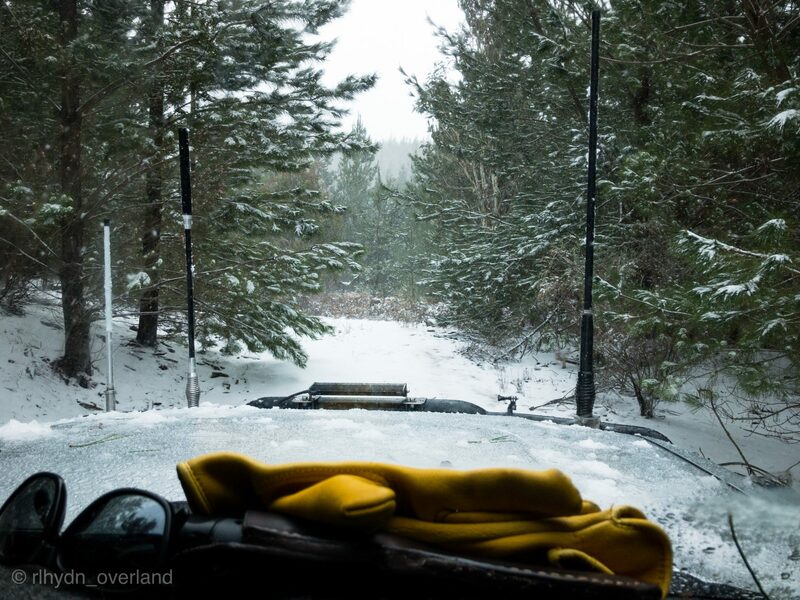 Listening to the snow fall onto the LandCruiser, as we pushed through pine branches. 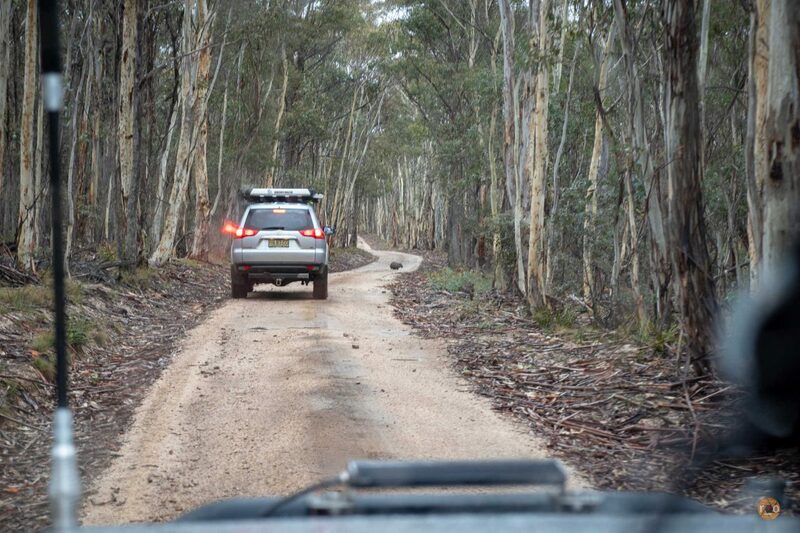 And just like that, the afternoon late, our muddy, snow sodden LandCruiser found the sealed road. Home and work requesting our weekly appearance. We aired up and bid our farewells to the snowscape. The white eventually thinning out as we travelled through Shooters Hill. Our weekend snoverlanding was put on hold until next time. 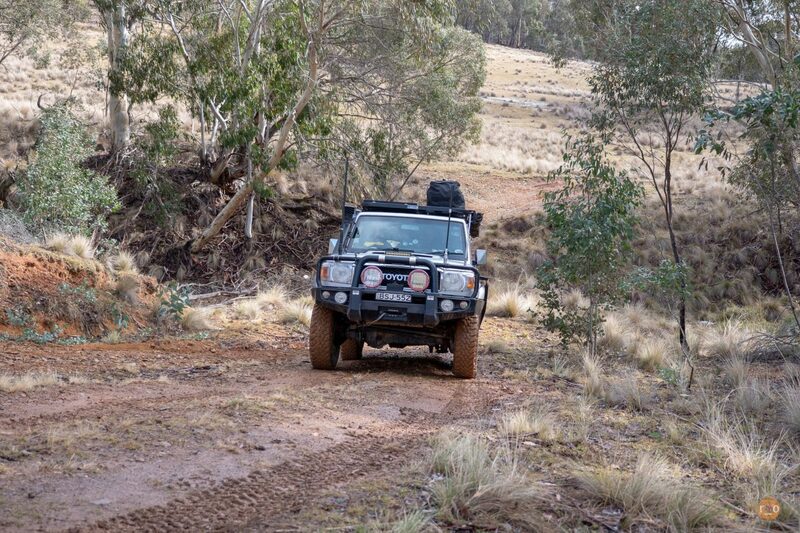 Huge thanks to our mate Aaron who guided us down some new tracks and trails for a terrific weekend wandering.